One of the most expensive office appliances is the printer, especially if you have an inkjet printer. The article on Reddit has numerous subscribers who have high opinions on the use of inkjet printers and the consequential costs of keeping your inkjet running. Depending on the industry you are in, there are reasons why you would need to print a lot of documents, but if its only documents that you are printing and you have no desperate need to print high quality colour images, then it would be more cost effective for you to invest in a laser printer. Ink is even more expensive than Brent Crude oil! 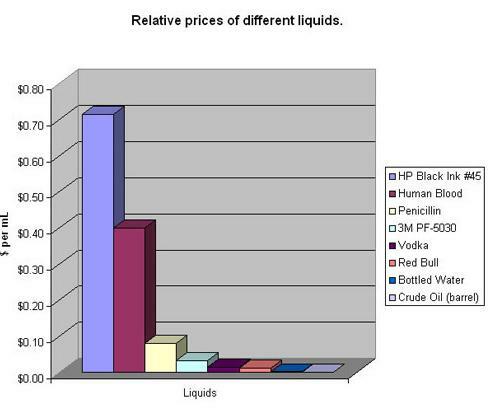 The graph below illustrates the difference in costs between ink for inkjet printers and other liquids. If you do not like the laser printer, there are other ways that you can cut down on the costs of printing, some of them more obvious than others. Keep in mind that when your printer indicates that you are low on ink, there is still a large amount of ink in the cartridge, which essentially is being wasted. Cover up the indicator with some tape so that the printer is fooled into believing that the ink cartridge is full. Remember that when your printing is streaky or you print a page and a blank page comes out that these are clear signs that your printer ink is definitely finished and you need to replace the cartridge. Purchase cheaper models of recommended brands where the ink cartridges are cheaper as well. An older model of HP or Brother is not redundant, you will still be able to pick up ink cartridges and get support when necessary. The cheaper models also do just as good a job as the more expensive models. Instead, buy cheaper non – branded cartridges or generic cartridges. Unless you really have to have the inkjet printer, purchase a laser printer as they are much cheaper to maintain. Of course the best way to save on printing costs is to only print something when it is absolutely necessary. By only printing the documents that you have to present in hard copy you are contributing to being eco-friendly, reducing your carbon footprint and saving yourself money on ink! Using email and electronic format for documentation which is globally acceptable these days is the best way to go, saves on paper, ink, time and frustration!